Manhattan firm Andre Kikosi Architect installed a folding Corten steel façade to transform this disused New York warehouse into a market and music venue. The motorised façade of The Wyckoff Exchange is made up of five panels, which fold outwards to shelter the pavement and reveal a glass skin beneath. LED lights hidden within perforations on the metal sheets give the building a glowing effect at night, when the shutters provide protection for the shops inside. 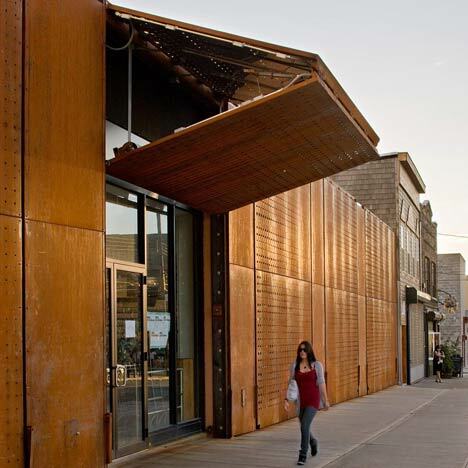 The building houses a live music and performance venue, an organic food market and boutique wine shop. Photographs are by ESTO/Francis Dzikowski. The Wyckoff Exchange in the Bushwick section of Brooklyn, New York is designed by Andre Kikoski Architect (AKA), an imaginative, award-winning architecture and design firm based in Manhattan. Scheduled to open in winter 2010, the 10,000 square-foot Wyckoff Exchange will accommodate a live music and performance venue - to be called Radio Bushwick, with interiors also by AKA - as well as an organic market and a boutique wine shop, all in a long-vacant warehouse in the heart of a vital and rapidly changing area of the city. The design solution for the building exterior is highly original, relying upon motorized door technology adapted from airplane hangars and factory buildings. The five pairs of moving façade panels create an ever-changing expression of function and tectonics. By day the panels fold up to create awnings for the stores and to shelter pedestrians; by night, they secure the shops behind them, while an abstract gradient of laser-cut perforations over semi-concealed LED lights makes the panels appear to glow from within - creating an enigmatic work of art on an urban scale. Andre Kikoski Architect’s design approach in the this project, as in all of its work, is aimed at creating a dynamic, fluid piece of architecture. As an expression of AKA's trademark resourcefulness and lyricism, and as an innovative approach to recycling buildings and creating a destination environment with an extreme economy of means, Wyckoff Exchange is truly a welcome development in this quickly evolving neighborhood. Cayuga Capital Management commissioned the project and has some 40 other properties in the area. Kikoski sees this one as "a prototype of adaptive reuse"—low-impact architecture that can spread, easily and gracefully, throughout the neighborhood. "The project," says Kikoski, "is a sign of things to come."